Work and play flexibly with this 15.6-inch Samsung hybrid notebook. Its AMD Ryzen 5 processor and 8GB of RAM keep productivity high, and a simple spin transforms it into a tablet for casual use and travel. 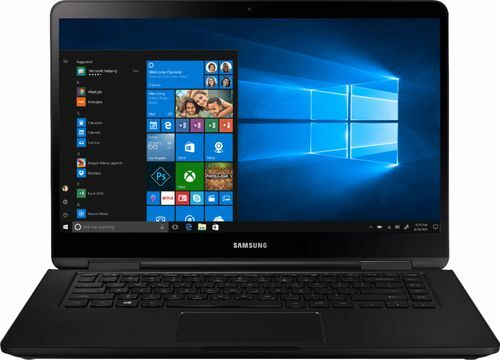 This Samsung hybrid notebook's 128GB solid-state drive provides ample storage and fast boot times. 15.6" Full HD touch screen The 1920 x 1080 resolution boasts impressive color and clarity. Natural finger-touch navigation makes the most of Windows 10. Energy-efficient LED backlight. Ryzen 5 Enjoy high application performance and smoother gaming experiences with AMD Ryzen™ 5 2500U processors, with machine intelligence, multitasking capabilities and efficient architecture with up to 4 cores and 8 processing. AMD Radeon Vega 8 Integrated graphics chipset with shared video memory provides solid image quality for Internet use, movies, basic photo editing and casual gaming. Built-in speakers SoundAlive makes auto adjustments to the sound quality to optimize your audio experience. Weighs 4.63 lbs. and measures 0.7" thin Thin and light design with DVD/CD drive omitted for improved portability. Lithium-ion battery. Backlit keyboard Allows you to enjoy comfortable and accurate typing, even in dim lighting.